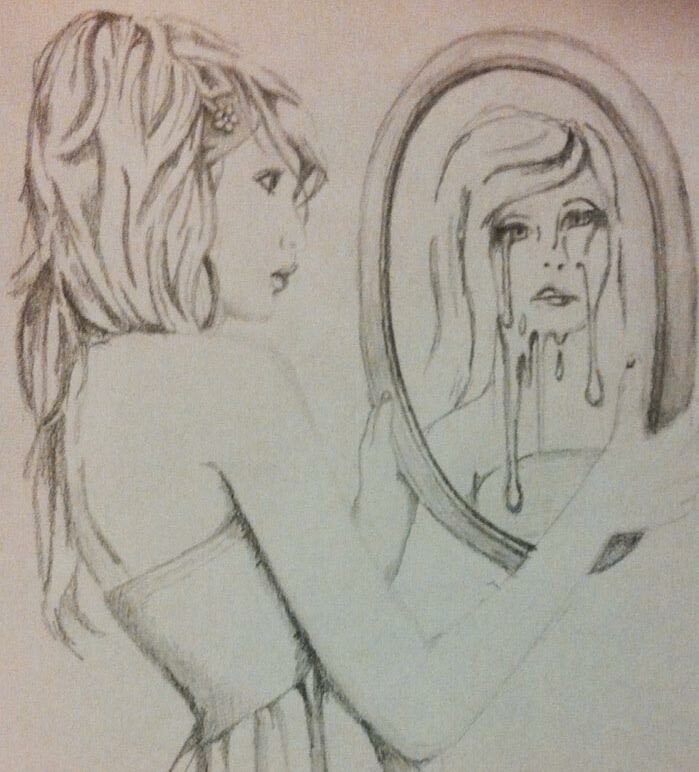 A BBC documentary about Body Dysmorphic Disorder. Three people with BDD are assessed by David Veale and offered therapy with Rob Willson, who helps them carry out tasks that confront their deepest fear – the way they look. A short Australian news program that interviews four brave sufferers on their experience with BDD. Stephen Westwood, author of ‘Suicide Junkie’ and ‘A Moment Gone’, and his wife, Ashley, discuss Body Dysmorphic Disorder with Trisha Goddard on her Channel 5 show (UK). Dr Phil, an American TV talk show host and psychologist, discusses BDD with sufferers. Dr Ben Buchanan is a psychologist who runs a BDD treatment clinic in Melbourne, Australia. When we first saw this cartoon, we groaned. We thought that the cartoonist had misunderstood the nature of BDD, which is of course defined as a preoccupation and marked distress with a perceived defect which is not noticeable to others. However this cartoon has another layer to it. Fables however often have a dark undertone (at least before being Disneyfied). In the original Ugly Duckling story, the Duckling was regarded as “different” from the rest of the brood and was mercilessly rejected and bullied by them – he was after all a swan. He was not shown much kindness in the wider world either. After surviving his first winter, he eventually embarks on an experiment to test out his fears (i.e. cognitive behaviour therapy with or without an SSRI anti-depressant!). With every expectation of being killed or humiliated, he approaches a group of swans. Instead of attack he finds acceptance and even admiration. He sees himself reflected in the lake, a beautiful swan… ahhh! This story resonates for many people with BDD who as children were bullied for being slightly different because of small stature, for example, or bat ears, acne, specific learning difficulties, sexuality and so on. 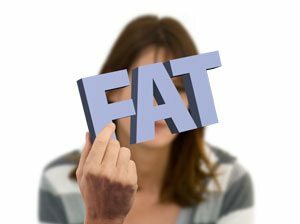 Many of these differences in appearance recede over time or can be treated cosmetically, but the psychological scars remain as BDD. The interesting thing about Hans Christian Andersen is that he apparently suffered from obsessive-compulsive disorder and was described as a “tall, ugly boy with a big nose and big feet”. When he grew up with a beautiful voice and a passion for the theatre he was cruelly teased and mocked by other children – maybe he had BDD? He apparently also suffered from a phobia of being buried alive (“taphephobia”). He placed a sign above his bed saying that he was not dead and directed that an artery be cut before his burial. Taphephobia was first described by Italian psychiatrist, Enrico Morselli, in 1890. 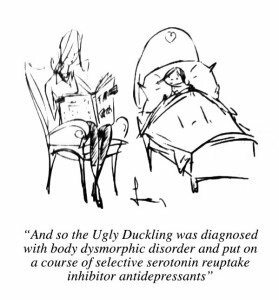 His paper also contains the first description of dysmorphophobia (the old name for Body Dysmorphic Disorder), which brings the story full circle to that of the “Ugly Duckling”!